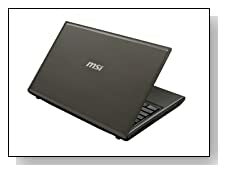 Gray MSI CX61 2PC-499US is a 15.6 inch budget gaming laptop with a solid fast 2.5 GHz Intel i5 processor, a decent NVIDIA Geforce GT820M graphics card so you get to play all of the latest games at lower or medium settings easily. It may not be the most powerful gaming machine in the market but the price you pay is probably one of the lowest too. If you’re a student or on a budget and looking for a powerful machine with nice features, this may be the right one for you. MSI CX61 has an Intel Core i5-4200M processor at 2.5 GHz speed, 8 GB (4GB x 2) DDR3L SDRAM at 1600MHz memory, 750 GB Serial ATA at 5400 rpm hard drive and Windows 8.1 multi-language operating system.. The 4th generation i5 processor, 8GB memory and the advanced gaming card provide smooth running of the latest games, perhaps not at the highest settings but you’ll still get decent performance. It will do well in all tasks other than gaming too. 750 GB hard drive is plenty as storage space for most laptop users. While you are likely to find an i7 processor in most MSI and other brand gaming machines, MSI chose to use a strong Haswell Intel i5 processor with a great NVIDIA graphics card to offer the best performance possible at this price level. 15.6-Inch LED backlit HD glare widescreen display with 1366 x 768 pixels max screen resolution, NVIDIA Geforce GT820M with 2GB DDR3 VRAM dedicated graphics card offers great picture quality along with decent gaming performance (you can play games like Total War: Rome II and Call of Duty: Ghosts at medium settings) and HD Audio SRS PC TruSurround XT Technology that offers immersive surround sound so that you enjoy playing games, listening to music and watching videos more, you kind of get a true home theatre feeling from a relatively small computer, the video and audio quality are the major strengths of this machine. HP Imprint finish with the micro dot design in anodized silver HP Pavilion is 1.29 inch thick and weighs 6.4 lbs. It has a full-size keyboard with a 10-key numeric keypad to help you manage your budget and pay bills easily. And it comes with a 6-cell 47WHr lithium-ion battery that allows you to use your computer for just under 5 hours in a single charge. MSI CX61 2PC-499US weighs about 8.1 pounds with measurements of 12 x 17 x 3.3 inch, so it is neither lightweight nor slim for a 15 inch laptop, but the weight and size are both what you’d expect from a gaming machine. It has the S-Bar design so you get to control the system functions by simply clicking on the mouse, 6-cell lithium ion battery offers pretty good battery life and the chiclet style keyboard has 102 keys including 10 key numeric keypad. Connectivity options are 802.11 B/G wireless (the connection starts within 3 milliseconds and easily transfers data within well over 100 metres), Bluetooth 4.0, 10/100/1000Mbps Gigabit Ethernet WLAN with RJ-45, 1 x USB 2.0 port, 2 x USB 3.0 ports for high speed data transmission, 1 x Audio-out port, 1 x VGA port, 1 x HDMI 1.4 port, 5 in 1 card reader (SD/SDHC/MMC/MS/SDxC), DVD SuperMulti optical drive and a 720p HD Webcam. Conclusion: MSI CX61 2PC-499US is great as both a gaming and a day-to-day school or home entertainment laptop. Firstly the negatives would be its 8.1 pounds weight and its 3.3 inch thickness (so not very portable), not having a premium feel in terms of build quality (it is plastic although solid) and not having a Full HD screen (although the image quality is great for games, videos or other stuff). 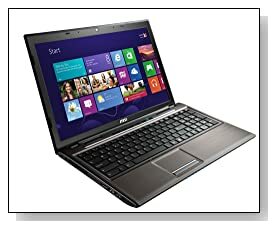 Long battery life to allow you to watch a long movie with and a couple of hours would be left after the movie, good quality speakers, top of the range graphics card, a powerful Haswell i5 processor, 8GB RAM, a DVD drive for easy game installation, a decent gaming keyboard design and more.. If you are on a budget and in the market for a good brand, solid build and a decent quality gaming system, this MSI CX61 may be the right one for you.